I hope you all had a wonderful weekend and are ready for an amazing week ahead! For today's look, I decided to go for a combination featuring chambray in a way that I feel would be perfect for the office or for days you may want to get a bit dressed up. Like with denim, chambray can be dressed up or down, so I encourage you to explore various options of styling your chambray piece, specifically a shirt. 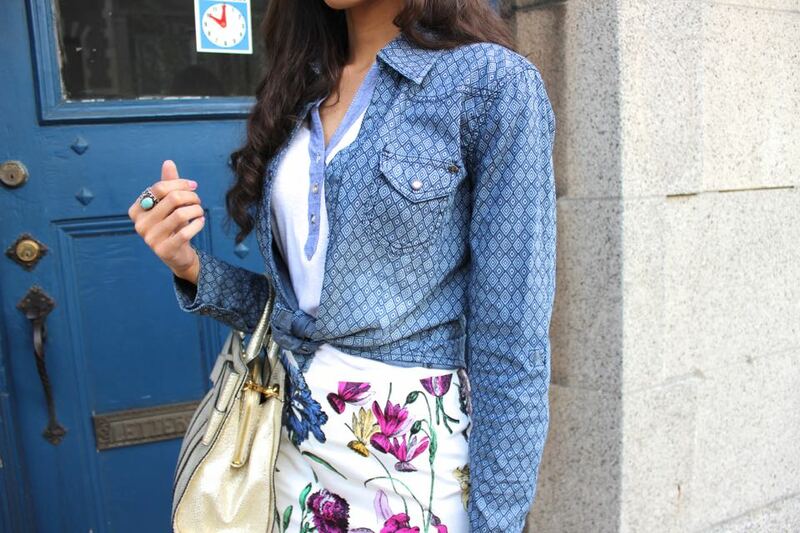 Perhaps you can wear yours paired with a floral printed pencil skirt, as I did here. It creates a bit of a more relaxed vibe to the more dressier feel that the pencil skirt provides. 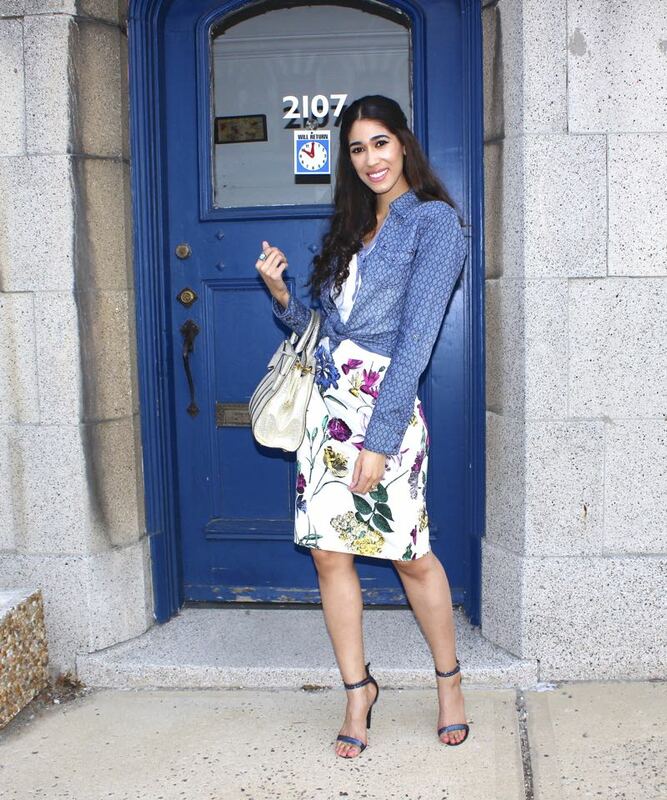 You may remember a few weeks back, I shared some tips on wearing and styling floral pieces in my post, What to Look for in Floral Prints to Create Your Desired (Figure Flattering) Effect. In that post, I explained the different illusions a base or background color of your floral piece, particularly black or white, can create to your body shape; I encourage you to check it out for more details on what you may want to consider when shopping. 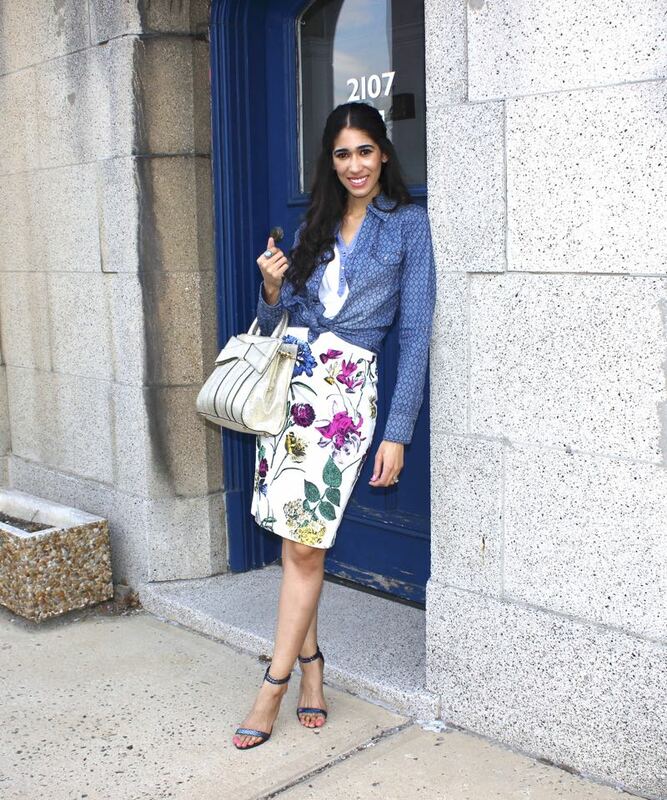 Since I'm wearing a white floral pencil skirt, I decided to wear my chambray shirt as a cardigan, leaving it open and knotted over a white tank that also features a hint of chambray. These details help to add dimension and interest to the upper portion of the outfit, preventing all of the focus from being placed on the skirt, creating a more figure flattering outfit for my pear shape overall. Styling the shirt this way also adds a relaxed vibe to the look, but you can of course wear yours as a shirt tucked in for a more polished, put-together pairing. A side note for all my rectangular shapes, tucking in or knotting your shirts will establish your waistline, which can be easily concealed with a pencil skirt; always look for ways you can bring attention to your waist by either tucking, knotting or belting. I believe this combination would be suitable and figure flattering for all body shapes overall, since we have a mixture of texture, print and style on both the upper and lower portions of the outfit. 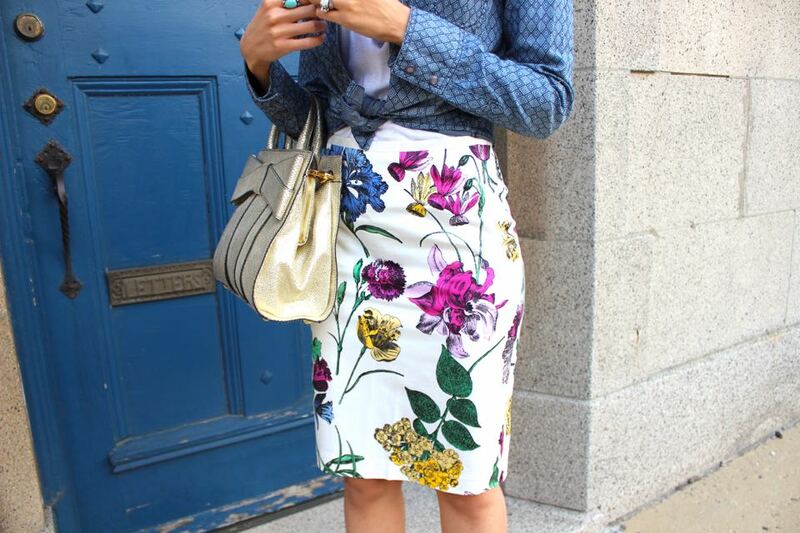 I also want to point out that a white printed floral skirt would look particularly flattering styled in multiple ways for the inverted triangle, apple and hourglass shapes. For the first two, the white background combined with the print will help to add some visual weight to the lower body, permitting for either of these shapes to go as simple as possible on top if desired, who doesn't love working with a no fuss piece?! The hourglass shape has a proportional figure, so there are many options that one can experiment with a skirt like this that will flatter those natural curves. 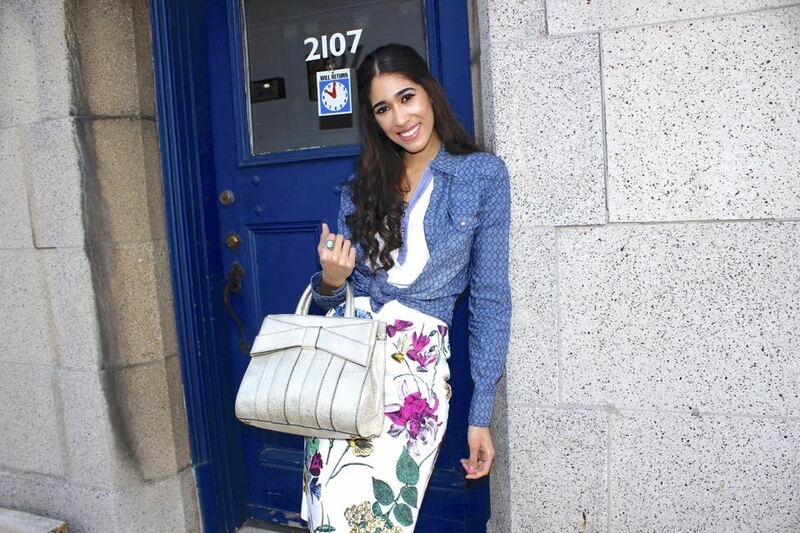 I hope this post provided you with some ideas on styling your chambray shirt in a different way this spring! Thanks so much for stopping by, my dear friends, and I hope you have a wonderful week ahead!